Editor's Note: This is the second article in a three part series on the bubishi. Part 1 discussed the book's origin and introduction through the writings of many early 20th century karate masters. Part 3 will discuss the availability of translations of the text in English, the text's impact on karate today and the current status of research on this text. The bubishi has over 30 chapters (depending on the edition) that focus on a wide variety of topics, including martial history, fighting strategy, vital point striking, hand positions, essential fighting techniques, grappling and escapes, herbal medicine treatment, forms and techniques and martial code. 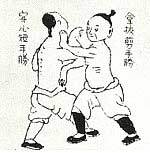 It also offers some history on the White Crane and the Monk Fist Kung Fu arts. Part 1- Articles on history, concepts, strategy and philosophy including White Crane and Monk Fist Kung Fu. Part 2- Articles, examples, definitions, diagrams and recipes for Chinese medicine, specific remedies and herbal pharmacology, including the concept of 12 hours chi (energy) flow (shichen cycle). Part 3- Vital points including types, locations, diagrams, periods for attack, restricted locations, and delayed death touch. Part 4- Fighting techniques, a list of kata moves, eight principles, maims, principles, six open hand positions, 48 self-defense diagrams, and Shoalin hand and foot, muscle and bone training postures. While many topics are discussed, most of the information is presented in outline form and thus for most readers will seem incomplete. For this reason many of the topics can not be fully understood from the limited information presented. For example, while the bubishi offers many illustrations of vulnerable points, it does not explain how to strike them, or what technique to use. Thus many important details behind these practices are missing. This lack of detail lends some credence to the theory that the bubishi may have been a personal notebook rather than a textbook. If the author had been in a martial training program, the notes taken would have been cryptic, something designed to work as a mnemonic device for future reference. In a different light, certain sections of the bubishi could be seen as a medical text. 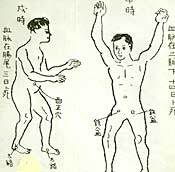 The charts showing where to strike vital points, the charts showing the vulnerability of those points during specific Shichen, as well as the "correct" treatment for those injuries might suggest the points are shown only for medical treatment purposes. Another section purportedly shows secret points that can be struck that will have a killing effect one-half or one year later. In some Chinese arts this is known as the "Death Touch," or "Dim Mak." The bubishi also contains considerable information relating to fighting. It contains lyrical descriptions of forms: some versions of the bubishi show a diagram of techniques, possibly from a form (kata). There are also discussions of combat principles and a lengthy discussion on grappling and escapes. Another interesting segment includes 48 Self Defense Diagrams. In each case the outcome of an encounter is shown. Both the winning and losing technique are listed along with a short synopsis of the strategy that led to victory. Here again, however, there is minimal discussion about how techniques can be applied. I would suggest that these herbal formulas should be carefully examined and not be experimented with, except under the supervision of a trained expert in Traditional Chinese Medicine knowledgeable in herbal formulations. We know the bubishi existed, but how do we track the actual influence it had on the development of the Okinawan arts? We know that some important karate masters in the past possessed copies of the bubishi, but there are no published notes, direct studies, or even oral history on the text's influence available for our review. Also, exactly who and how many people possessed copies of the text is open to which "legends" one wishes to listen to. Was the bubishi truly kept private for the select few? Were those who possessed the bubishi sufficiently literate to read and understand the text which was written in an older style Chinese dialect? And if they could read the text, did they possess enough knowledge of Traditional Chinese Medical theory to use and apply the information? Was the bubishi used to design training, such as teaching the defensive theories directly to the students? Or was the bubishi little more than a learned curiosity, something valued but not understood, something to be placed on the shelf to be revered but not actually used? Without historical proof, it is very difficult to know the truth. We know that Mabuni, Funakoshi and Yamaguchi felt the bubishi was important enough to "announce" its existence by including portions of the text in their own works. Others famous masters, such as Higaonna, Itosu, Nakamura and others also had the text and passed it on to their most trusted students. Miyagi Chojun also felt so strongly about the bubishi that he reportedly took the term "Goju" from it as the name for his system of training. According to Patrick McCarthy (The Bible Of Karate: bubishi), Miyagi took the name Goju from a section of the bubishi titled, "The Eight Precepts of Quanfa" which speaks of inhaling as representing softness ("Ju" of Goju) and exhaling as characteristic of hardness ("Go" of Goju). (4) Others suggest, however, that while Miyagi was influenced by the bubishi, he took his style name from other sources. (5) Material in the bubishi may also have provided Miyagi with inspiration for developing his famous Tensho (Rolling Hands) kata. Tatsuo Shimabuku (the founder of Isshinryu) chose the eight poems of the fist (Chapter 13) of the bubishi to be the Isshinryu Code of Karate. As to the impact of the bubishi's sections pertaining to chi meridian theory, there is no evidence that they were used in the historical development of Okinawan karate. 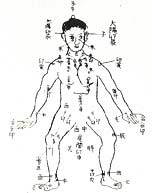 Certainly there existed knowledge of vital points and methods to strike them which relate to acupuncture points. But, there is no evidence that this knowledge was taken to a much more complicated level which involved understanding not only concepts of energy flow, but also related timing patterns. From what I've heard, there is no evidence that the Okinawans ever referred to the Meridian charts." There have been many explanatory books and commentaries written on the bubishi in Japan, none of which are available in English. I also strongly suspect there are many instructors who have prepared extensive analyses concerning the bubishi, but this information is not readily available to the martial arts community. A great deal of time is likely being spent following the same lines of thought over and over again due to the unavailability of research and analysis of the texts contents and theory. (1) Christopher Caile in a communication with this author has noted that in addition to the 24 hour cycle of Chi, what is also important but unstated in the bubishi, is that chi theory (in Traditonal Chinese Medicine) also includes a larger yearly cycle that greatly influences the daily cycle. Thus a technique based on the daily cycle will be much more effective when done at a certain period of the year. This, however, is not discussed within the bubishi. (2) Conversation with George Donahue, a member of the Kishaba Juku organization, related the following observation about the bubishi to Christopher Caile: His organization has passed down the work for five generations, having made hand copies of the manuscript along with many notes. Donahue believes, however, that the most useful information is contained within the notes (overlays of onion skin with notes) themselves. Included are critiques of information within the bubishi including what works and what doesn't. Thus, while the bubishi is considered important in itself, it did not significantly influence his organization or its teachings. One of the bubishi copies, Donahu noted, was originally from Nakamura sensei. Another one passed down is from the late Kishaba sensei. Donahue's teacher and head of the organization, Shinsato sensei, has collected, annotated and bound a lot of information on the bubishi and other texts. (3) Miyagi was well aware of the bubishi and even quoted from the book in an August 1942 essay that appeared in "Bunka Okinawa" that was titled "Breathing In And Breathing Out In Accordance With "Go" And "Ju": A Miscellaneous Essay On Karate." Notice the similarity of the essay's name with the section from the bubishi after which Miyagi is reputed to have named his style. It is perhaps this similarity that led some to suggest that "Goju" as the name for Miyagi's style came from this source. (4) A more likely derivation for Goju karate's name lies elsewhere. Representing Miyagi at a 1930 All Japan Martial Arts Exhibition was his senior student Jinan Shinzato who was asked the name of his ryuha (school). Shinzato. The style having no formal name at the time other than association with its Nahate, Surite and Tomorite lineage, and Shinzato replied to the question, "Goju" (meaning hard/soft). This was later related to Miyagi, who adopted the name. Others, however, suggest that Shinzato never gave an answer to the question about the name of his ryuha and that Miyagi later coined the name after thinking the problem over. translation made of the 39 pages from the bubishi that appeared in Yamaguchi's book, "Karate-Goju-Rui By The Cat." The translator, who is well versed in Chinese herbal medicine, noted numerous inconsistencies , possible errors, as well as the names of herbs not generally recognized. It was suggested that these unknown herbs might have been local herbs, or local names for well-known herbs. Furthermore some methods ofpreparation are not fully explained. (6) From a private interview of Miyazato by Christopher Caile held in Naha, Okinawa, while Mr. Caile was studying in Miyazato's dojo in December, 1994.